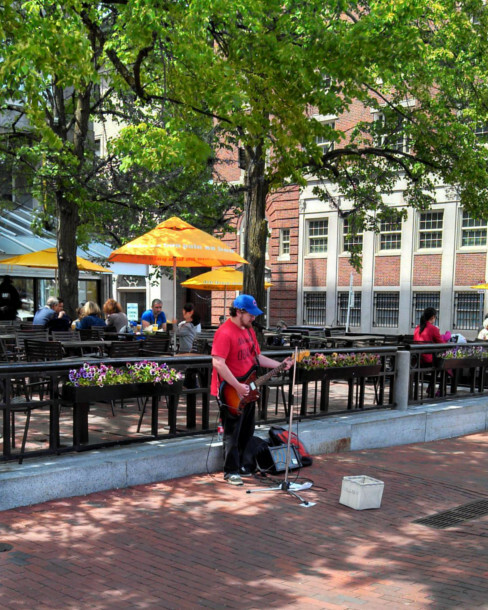 Sitting at a small Central Square café, I was given an amazing history lesson of Boston and Cambridge’s busking past. I learned that Central Square is off limits to buskers, because there was construction going on when the latest laws were written. I learned there is a statue dedicated to Igor Fokin, a renowned puppeteer who performed in Harvard Square, on the street corner where he interacted with people through his handmade marionettes. I learned that the band Guster got their start as a band at Tufts who frequently busked, and even returned to play on the streets of Harvard and Boston (with Keytar Bear!) the day their new album Evermotion was released earlier this year. I learned that there are still people that are incredibly passionate about street musicians and street performers. Possibly the most enthusiastic of them was sitting across from that table from me – West Cambridge native and Harvard Square busker, Ben Cox. Since then, a lot has changed. Cox now has a list of over 100 songs he has prepared to play while busking which includes both originals and covers ranging from Elvis to Jimmy Eat World to Radiohead. Now listeners are saying, “That’s good music.” Sure, people may still yell at him from time to time, but the positive reactions certainly outweigh the animosity. He once had a listener join in on singing Marketa Irglova’s part in Falling Slowly from the Academy Award winning movie Once, which she co-wrote with Irish busking legend Glen Hansard. The guitar cable he still uses while busking was given to him by a random stranger walking around with old gear he was giving away to musicians who would value it. Cox has certainly found his stride. The development of his performance is quite complex actually. For covers, he will sometimes play the dominant guitar part, but for others he will study the live versions rather than the definitive versions of the songs and develop chords with more precise notes. Busking is a very important part of Cox’s musical life, as he spends Mondays, Fridays and one other day of the week busking in the spring and summer, which is his primary focus in the warmer months. He also spends time adjusting his set list, adding songs he thinks would appeal to the crowd and removing those that didn’t attract listeners in his previous sets. In the winter, Cox focuses on his side projects and writing original music. Right now, he is slowly transitioning back into busking, spending about five to ten minutes a day preparing a song on his list. His two solo projects that he has pursued thus far are Mimic the French and Sodawars. Mimic the French started while he was in high school and it just kept going. The earlier stages were pop punk, but it transformed into a more straightforward rock project, and even became borderline progressive. Sodawars is Cox’s post-rock project, heavily influenced by Mogwai and Explosions in the Sky. He began writing songs that didn’t have words and compiled them because they didn’t really fit with anything he was working on by himself or with friends. 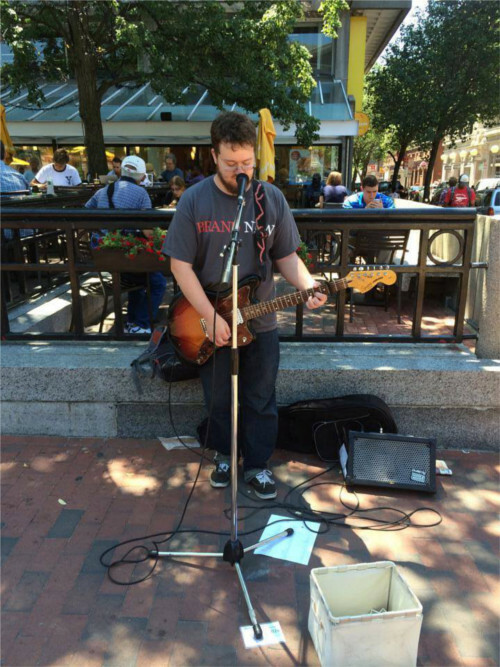 His recent track, Wait for the Sun, debuted through Boston Busking, was partially written through improvisation while busking. Ben Cox gave me a history lesson about busking in Boston and Cambridge, and it was so interesting to learn about its development over the years to what it is today. Not only is he knowledgeable about the past of his craft, he is an incredibly talented guitarist and songwriter that is continuing to develop and perfect his abilities. He is focusing on his confidence with singing and crowd interactions. As he continues to develop as a musician with more solo projects and possibly with a band in the future, he undoubtedly will add even more skills to his busking repertoire. It was a delight to learn from Cox, and I would highly recommend checking him out in Harvard Square when the snow melts.